The Dutch Open just concluded, and PokeStats is not going to include the results in our typical Meta Share data (line chart and pie graph pages). The reason is because the Open was a "Special Event" and not a typical Regional or other tournament; there was an unusual prize pool in terms of CP as well as presumably a smaller attendance. Anyway, I have not found any available data on lists past the Top 8. We'll cover the Open more like we cover ARG events: in this post, I'll list the Top 8 and show a pie chart of the CP breakdown within the Top 8. I'll also give a little analysis on the meta, a few rogue surprises, and how this could impact the upcoming Athens Regionals. In all, a total of 615 CP were available in Top 8. Three rogue decks in Top 8! 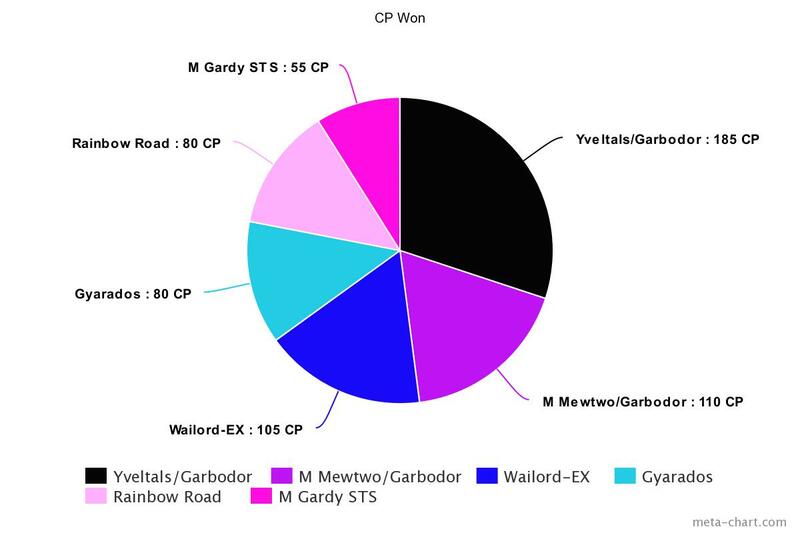 Rainbow Road has been on a big decline recently; Gyarados has always been pretty under-the-radar, and Wailord? Rainbow Road was 11th in PokeStats's Power Rankings entering the Open. The deck list has not yet been made available, so we don't yet know if this list had any interesting features that would've propelled it into the Top 4. Rainbow Road has been on a rapid decrease in Meta Share recently, and I don't expect it to make have of a renaissance. It's interesting to see that it's still being played, though. Rainbow Road was climbing consistently... then it dropped. Many people believe Octillery is the best play for Gyarados, rather than Shaymin-EX. This list seems to be more speed-based with the pair of Shaymins and Acro Bikes, but also prioritizes recovery with 4 Puzzle of Time, 4 Buddy-Buddy Rescue, and 4 Teammates. The most creative inclusion is the 4 Lucky Helmet. Previous lists haven't taken advantage of Gyarados' θDouble Ancient Trait, usually just running a couple of Float Stones. 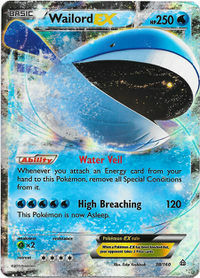 This list allows you to attach 2 Lucky Helmet to a single Gyarados, essentially guaranteeing you 4 cards going into your turn to deal with whatever your opponent did last turn, and making the N-to-one strategy basically nonexistent. Additionally, a copy of Spinda PRC was added, a card which is typically included in other decks as a hard counter to Gyarados itself. Its inclusion here is to deal with 220-HP Mega Pokemon or Fury Belted EXs, since Gyarados's damage output caps at 210. I really like the thinking that clearly went into this list and hope Gyarados continues to do well at future tournaments. Finally we have Wailord-EX, a deck that has had some surprising top-level finishes over the past couple years but has always been considered rogue. The version at the Open was a "toolbox" deck; you can check out the full list here, but there were some very interesting inclusions. My favorites are one copy each of Hoothoot BRT (for Item lock) and Minccino FAC 86 (for Tool removal). The list also plays Poké Puff, 3 Lysandre, but only 2 Crushing Hammer. 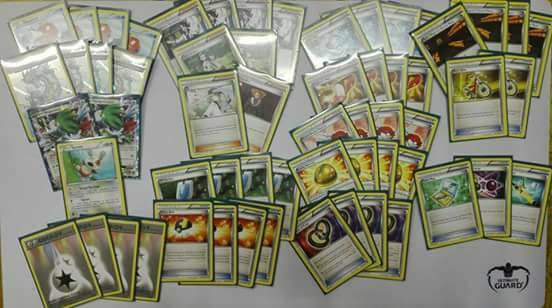 An interesting list that was no doubt painful to play against. That wraps it up for our Dutch Open review. Athens Regionals (Georgia, not Greece!) are on the way, and we're going to be analyzing the top-tier decks in the format in a future article, with some new in-depth stats. We're also going to publish a Sun and Moon set review... so stay tuned! Hi! Thanks for the great information you have provided!Any way I'll be subscribing to your feed and I hope you post again soon.